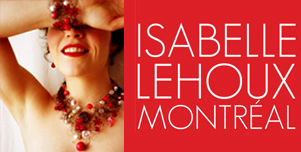 The singer and composer Isabelle Lehoux, that we spell in the fashion world "la Castafiore du bijou", presents 3 albums. The first "IL" is world music. The second "Isabelle Lehoux LIVE " recorder at Place des Arts, is soft and sweet. The third, OU HABITER, is writing by Celine St-Pierre and composed by Isabelle Lehoux. It is poetic album and very soft to listen. Instrumental piece and voice created and interpreted by Isabelle Lehoux. French song by Danielle Messia (De la main gauche) performed by Isabelle Lehoux. Song of Argentine style tango created and interpreted by Isabelle Lehoux. Song of Blues style created and interpreted by Isabelle Lehoux. Song in French pop-rock style interpreted by Isabelle Lehoux. Song created and performed by Isabelle Lehoux.